Drive from Axum to Hausein via Adwa and Adigrat. For the Ethiopians, the town of Adwa holds huge significance. It was in the hills surrounding Adwa that the Emperor Menelik II inflicted the biggest defeat ever on a colonial army in Africa and saved Ethiopia from colonization. About 11km east of Adwa is the monastery of Abba Garima, said to have been founded by one of the nine saints in the 6th century. The monastery is known for its collection of religious artifacts including three illuminated gospels from the 10th century. Use the town as the base from which to visit Yeha or Debra Damo. Yeha is famous for its huge and remarkable temple. According to the 19th-century German scholar Heinrich Miiller, the temple is thought to date back to about seven or eight hundred years before the birth of Christ. The temple is believed to be the oldest standing building in the country. Beside the remarkable temple stands a church dedicated to Abba Aftse. Abba Aftse was one of the famous nine saints who came to Ethiopia in the 6th century from the eastern Roman Empire to teach the Gospel. The church, sharing the same compound with the temple is rectangular in shape. Proceed to Debre Damo monastery accessible only by rope and not allowed for women. Then continue driving to Adigrat for lunch at a local restaurant. Adigrat is the largest town in Tigray after Mekelle and is an important junction linking Ethiopia with Eritrea. Finally drive to Hawzen for overnight via Sinkata, situated 36km south of Adigrat. Adigrat is a quietly attractive village of stone houses with sandstone cliffs to the east offering stunning views of the Gheralta plains. You can use the town as the base from which to visit the rock hewn churches at Gheralta. In one day you will visit three churches; Abuna Yemata Guh; Maryam Korkor and Daniel Korkor. All of which are very different in style but stunningly beautiful in their own way. 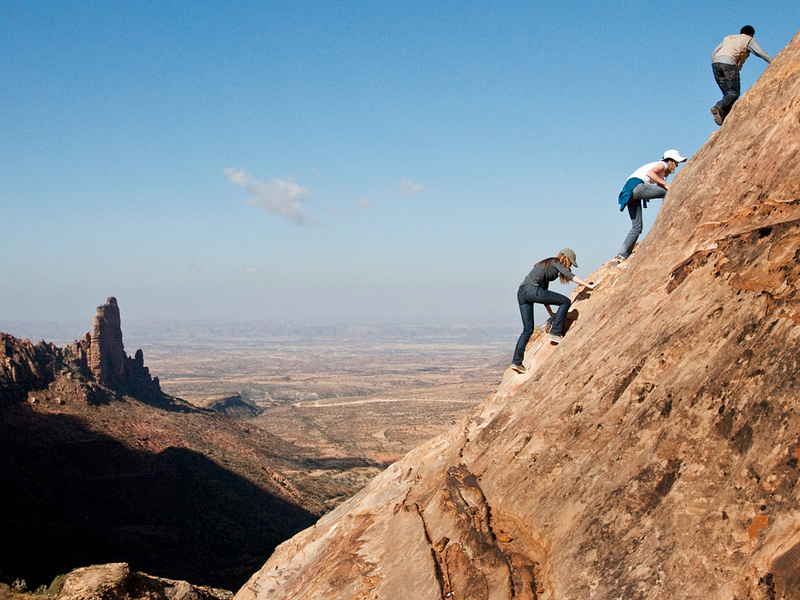 To visit Abuna Yemata Guh, walking for about an hour to commence a steep ascent up the side of the Gheralta massif. This steep ascent soon turn into a climb using foot holds and hand holds chipped into the sandstone rock by the passage of many hands and feet. The climb and the walk along very narrow ledges with sheer drops to the side is not one for the faint hearted. The church itself can be reached by walking out on a ledge one meter wide and with a 200m drop to the left hand side. At the entrance there is a small cave and a wooden door built into the rock. Of the three, Maryam Korkor is the most impressive architecturally. A huge, high ceiling is supported by 12 free standing pillars. Looking at it you could not help but wonder how the architect managed to carve so high from the ground.